Publisher: Orig: Harper, 2013, 336 pages. Audiobook by HarperAudio, 2013. Before her death, Usha was staying at an ayah's hostel alongside Indian women whose British employers turned them out into the street--penniless and far from their homeland--when their services were no longer needed. As Maisie soon learns, Usha was different from the hostel's other lodgers. But with this discovery comes new danger: another Indian woman who had information about Usha is found murdered before she can talk to Maisie. As usual with this series, I enjoyed the book very much. I have been listening to many of these books, and Orlagh Cassidy does a very nice job of reading and voicing the characters. In a British novel of this period (or any?) the accents of the characters say so much about them, and I thought she did a great job, though I'm no expert. The story is complex and intricate, and deals with a number of timely issues about prejudice and discrimination (and about colonization and imperialism). There is throughout the book a sense that everything is changing, and characters are spinning off into their own lives, as may happen. I had some amorphous feelings of dissatisfaction while reading, and on reflection think they are due to these changes. I've gotten used to a certain structure of relationships, and apparently don't like change. 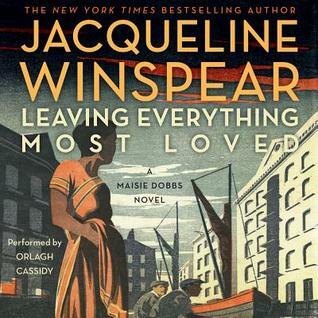 Clearly the author has some new plans for Maisie; I was a little worried this might be an end to the series, but observe that the next book is already out, so that's safe. In the end, I found the book very well-written, and the mystery convincing. There is no easy solution, and the challenge that her discoveries presents Maisie and the reader is part of what gives the story meat. I strongly recommend this series for those who like mysteries that are character-driven but dig into a serious and challenging puzzle as well. Winspear doesn't pull any punches about social issues, not all of which are limited to the 1930s. I recommend reading the series in order, as the characters and relationships grow and develop throughout and may be a bit confusing if you start in the middle. Full Disclosure: I checked Leaving Everything Most Loved out of my library, and received nothing from the writer or publisher in exchange for my honest review. The opinions expressed are my own and those of no one else. I am disclosing this in accordance with the Federal Trade Commission's 16 CFR, Part 255: "Guides Concerning the Use of Endorsements and Testimonials in Advertising."